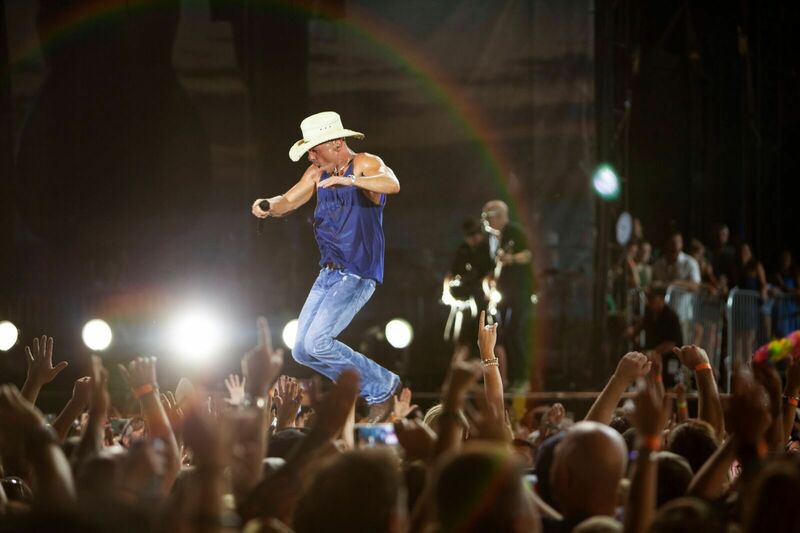 Kenny Chesney came into Nashville’s Nissan Stadium with two No. 1s in the space of three weeks – sharing David Lee Murphy’s “Everything’s Gonna Be Alright,” then hitting the top of the Country Singles chart for two weeks with his own “Get Along” – and the No. 1 selling debut Songs for the Saints. Anticipation was such that the Tennessee State Highway Commission opened the currently closed for repaving and repair traffic loop for the I-40/24 and I-40/65 splits to ease the burden of traffic for country music lovers attending Nashville’s Trip Around the Sun Tour stop. It was a smart move. Not only did the only country artist on Pollstar’s Top 10 Tours at Mid-Year deliver two high energy hours that included “American Kids,” “Noise,” “Young,” “No Shoes, No Shirt, No Problems” and “Get Along” – he broke One Direction’s 2014 record of 54,249 with 55,182 fans in the home of the Tennessee Titans. In a summer of shattering his own attendance records, Nashville continues the trend on his 2018 Trip Around the Sun Tour. With 19 major stadiums, plus a handful of amphitheaters, the man the LA Times hails as “The People’s Superstar” is among Taylor Swift, the Rolling Stones, Jay-Z and Beyoncé, Bruno Mars, U2, Justin Timberlake, the Eagles and Pink as the year’s big tours. The charge between the songwriter/superstar and the audience isn’t just a live equation. Songs for the Saints, which benefits the Love for Love City Fund, topped the Country Albums chart and was the biggest selling debut on the Top 200. On the heels of the record-breaking “Get Along,” Chesney’s 30th No. 1, which made him the artist with the most No. 1s in the history of Billboard’s Country Airplay Chart, breaking records seems to be the order of the summer. Starting with a no-holds-barred set at Tampa’s Raymond James Stadium with 55,292 fans and running through last weekend’s trip to Ford Field in Detroit, the songwriter/superstar from East Tennessee has been breaking his own attendance records at almost every stadium this summer. With fan-friendly pricing, a high energy show and just enough people coming together to create a real community beyond just the concert experience, Chesney remains the “must” rite of summer for so many. Heading into MetLife Stadium this weekend, the 8-time Academy of Country Music and Country Music Association Entertainer of the Year is celebrating the release of his deeply personal homage to the Virgin Islands, Songs for the Saints. Begun as Hurricane Irma was pummeling the Caribbean islands where he’s made his home, the song cycle celebrates the spirit of the land, the people and the living that inspired so much of his music since the 5-times platinum No Shoes, No Shirt, No Problems.